We provide mouth watering Special Masala Peda which is trusted for our commitment in providing the best sweets all over the world. It is prepared from premium quality desi ghee and pure ingredients. We also offer a proper packaging to ensure safe and hygienic product to our valued clients. 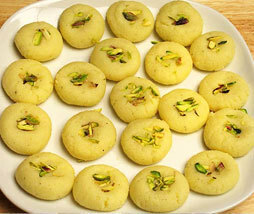 It is made of pure mawa and other important ingredients.